Cinema is rich in films that tell the story of simple men who dash themselves against the rocks of misfortune: of impotence in the face of corrupt authority and arbitrary fate. Good men are not rewarded: justice is not done. In general, I find such tales uncomfortable viewing. In fact, I find them sadistic. You take a good man and watch him suffer for two hours with the director casting himself as the uncaring and inscrutable God of the Book of Job. So why is it that while I found the Coen Brothers' A SERIOUS MAN and INSIDE LLEWYN DAVIS unappealing I was bowled over by LEVIATHAN? I suspect it's because there is no knowing, snide humour in LEVIATHAN, although it is sometimes funny in a low-key way. Consequently, rather than being outside of the movie laughing at its central character's misfortune, we are inside the movie, sympathising with him. Or maybe it's because the subject matter is so much more urgent when situated within contemporary Russia, a totalitarian kleptocracy worthy of the movie's title. At any rate, I am not alone. LEVIATHAN has garnered critical acclaim and awards wherever it has been shown. And in a brazen act of co-option is the official nomination of Russia for the Academy Awards. It's featured in many a critic's Best of 2014 list and you'll be hearing more about it as awards season gathers pace. All of this is justified. The movie opens with a scene of water crashing on the rocks of the Barents Sea. Our "serious man", Kolya, is picking up his old army friend turned Moscow lawyer Dmitri from the train station. Kolya needs help fighting the local mayor Vadim who's after his land and has engineered a corrupt legal case to get it. In a tour de force scene the court magistrate reads out the full ruling against Kolya with barely a pause for breath, symbolising the claustrophobic suffocation of the state and the inability to get a word in edgewise. But the case becomes more sinister when we realise that all the machinery of power is in league against Kolya. The boorish drunken mayor is in league with the police and the clergy, whose priest preaches patience and fortitude rather than earthly resistance. The corruption of society is shown by means subtle and crude. The director Andrey Zvyaginstev frames the first negotiation between Dmitri and Vadim as follows: a portrait of Vladimir Putin top left, Vadim seated middle centre, and Andrey, supplicate bottom right. It's as though we can literally see the chain of corruption weigh down from Putin to Kolya. More crudely, but hilariously, we also see the frustration of the ordinary men quite literally vented as they take rifle practice against portraits of of old Soviet leaders. Kolya's friend argues that he can't yet show the current leaders as there is no historical perspective - but I wonder if this is the film-maker protecting himself. As we move into the second half of the film the corruption seeps into the family itself, lurching the viewer into surprising and deeply unjust territory. All of this leads Kolya into a direct confrontation with God and the clergy. The analogy to the Book of Job is at its most stark, and Kolya's rejection of that resignation undoes him. But the most powerful scene of the entire film is its final scenes when all is revealed - all motivation - all corruption. We watch a parade of flashy Western cars driven by the small-town oligarchs driving away and go back to the imagery of the rocks. It's the most angry I've felt at the end of a movie in quite some time. LEVIATHAN is a beautifully shot, technically accomplished and emotionally affecting movie. More than that, it's important. We might know about the corruption in Russia in a kind of abstract way - reading articles in The Economist in the Financial Times - but this is the first time I've seen it taking its toll on a normal family in a normal town. In a strong field, LEVIATHAN deserves to take the Best Foreign Language Oscar. LEVIATHAN has a running time of 140 minutes and is rated R. The movie played Cannes, Toronto, Telluride and London 2014 and was released last year in France, Belgium, Hungary, the Netherlands, Poland, Malta and Serbia. It is currently on very limited theatrical release in the UK and USA but is also available on some streaming services. It will be released in Denmark on January 6th, in Turkey on January 16th, in Norway on January 23rd, in Russia on February 5th, in Greece on February 12th, in Germany on March 12th and in Sweden on March 13th. Oleg Negin and Andrey Zvyagintsev won Best Screenplay at Cannes 2014. 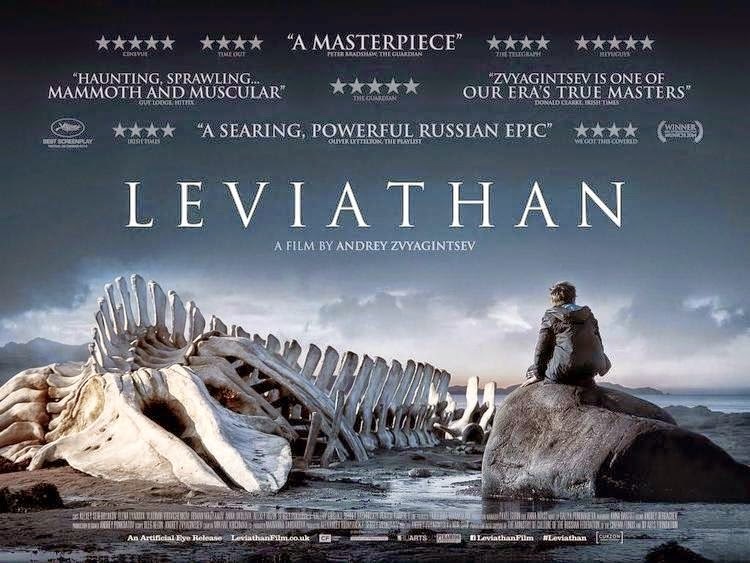 LEVIATHAN is the official Russian nomination for the Academy Awards. It has received a Golden Globe nomination for Best Foreign Language film.